NuWaves’ unique tri-band multiplexer design successfully completed multipaction testing exceeding 800 Watts at each band, while achieving insertion loss of less than 0.5 dB for each band. 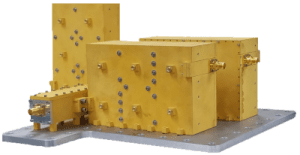 This high performance tri-band multiplexer design serves the Air Foprce Research Lab’s (AFRL) Technologically Advanced N-plexer for GPS III Operation (TANGO), raising the bar for space qualified components by creating best-in-class multipaction performance. NuWaves Engineering developed a triplexer for use by the Communications at Speed and Depth Program(s) for the Navy. The triplexer designed by NuWaves Engineering was Military UHF SATCOM Band Compliant and MUOS Band Compliant allowing for ease of integration for the customer. 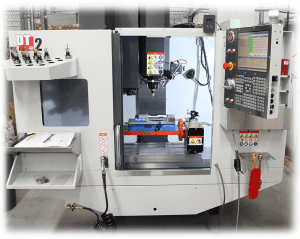 Additionally, the final product also achieved a lightweight design, low insertion loss, low manufacturing cost, support of high G-Force applications, high out-of-band attenuation, high RF power handling capability, and high reliability. Design and Development of a multi-band Front-End filter employing tuned inter-digital filter techniques and the design of a multi-band multiplier for a telemetry system operating in L & S-Band. 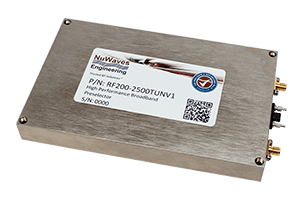 NuWaves’ HiperTUNER is a state-of-the-art miniature RF Tuner utilized for RF signals in the band of 200 MHz to 2.5 GHz. HiPerTUNER meets the demanding need for high performance receiver pre-selector and transmit filtering for applications involving RF communications and signal exploitation, inclusive of SIGNIT, COMINT, and ELINT. The HiPerTUNER integrates with a host controller or terminal program and utilizes a straight-forward command/control interface for ease of integration. The HiPerTUNER provides high-dynamic range performance with low noise figure and boasts superb multiple-cascaded varactor-tuned filtering achieving bandpass filter bandwidths of 1-3%. In addition to providing high-performance filter and multiplexer design services, NuWaves also offers quick-turn custom filter design services for moderately complex filter designs, supported by NuWaves’ very own in-house Machine Shop. 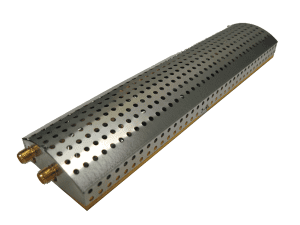 In need of a simple lumped element or SAW drop-in filter for an existing system? NuWaves also offers a line of Miniature, Connectorized Filters. Additionally, NuWaves offers Harmonic Filter solutions and a Quick-Turn Custom Cavity Filter service.